Commercial, prefabricated grill covers can be needlessly expensive, but you need something to protect your grill from inclement weather. If you know your way around a sewing machine, you can make your own grill cover out of canvas fabric and a generous coating of waterproofing spray, which you can find at hardware stores and some craft stores. With your homemade grill cover in place, you can keep your grill in good working condition for years to come. A homemade grill cover will protect your grill from bad weather. Measure the width and height of each side of your grill and write your measurements down on a pad. 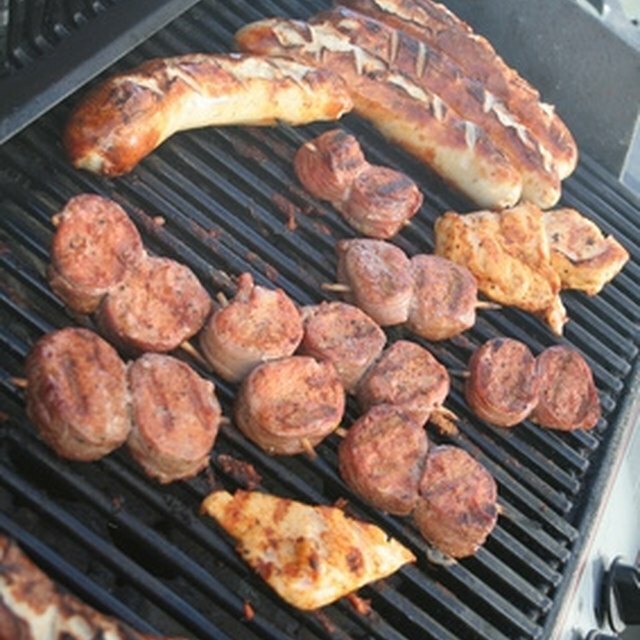 Measure the length and width of the top of the grill, as well. Combine the measurements for the back, front and top of the grill to make one unit. This will make things easier when it's time to sew the pieces together. Add about one and a half inches to each measurement to allow for seams and to make it easier to slip the cover on when it is finished. Draw rectangles using the measurements you took earlier onto pieces of pattern paper. You should have three rectangles all together: one for the back, top and front and one each for the left and right sides. Cut out the rectangles -- these will make up your grill cover pattern. Pin or tape the grill cover pattern to the canvas. Cut along the outside of the pattern with a pair of good, strong scissors. Set each piece aside on your work surface. When you are done cutting the three pieces out, hold the edges together and pin them together to make a loose version of the final product. Slip it over the grill to make sure it will fit. Set your sewing machine up with a high-gauged needle, about 18 or higher, and sew the pieces together. Start at the bottom of the left side and work your way up the side, across the top and down the other side, removing the pins as you work. Cut the thread, flip the grill cover around and repeat the process for the right side. Slide the grill cover over your grill to make sure it fits. While it is on the grill, spray it with waterproofing spray. Allow the cover to dry. When the cover is dry, flip it inside out, slide it back over the grill and spray it down again.